The number of bookmarks displayed in a folder is limited to 250. If you create more than 250, they are stored successfully and can be accessed and exported from DianHuaDictionary.com, but you will only see the first 250 in the application. Attempting to create duplicate folders can lead to the duplicated folder acting as a virtual root which also breaks synchronization with DianHuaDictionary.com. Cleanup up a variety of memory leaks. Corrected a memory management error that could lead to an application crash. Beyond these bug fixes, I decided to go ahead and add some study tools to the dictionary to take better advantage of bookmark data. My patience with some of the study tools I had been using was exhausted as of last week so I was ready for something that better met my own needs. I’m hopeful the resulting tools will help you with your Chinese studies as well. As you might have guessed, one of the tools I created is Flashcards. One of the things that has most frustrated me about other tools I have used is that if you are studying characters, it isn’t always easy to show the character on the back of the card. It didn’t take much character studying for me to realize I retain the characters much better if I see them right next to the Pinyin. Consequently, DianHua Dictionary’s Flashcards allow you to select exactly what you want to see on the front and back of the cards. As you can see from the images, all fields are available on both the front and the back of the cards. These images also show the two options for ordering Flashcards. The first is Random which is self-explanatory. The second is titled Difficulty, and it is my attempt at creating a study algorithm that emphasizes Flashcards you have identified as a problem. This is an algorithm I will fine-tune as I do more research on learning algorithms, but I am optimistic that it is a reasonable starting point. The other study tool I created came at the suggestion of one of DianHua Dictionary’s users. It presents you with the Pinyin and/or English of a bookmark entry and asks you to type either the Traditional or Simplified characters. It works off of the same metrics as the Flashcards so words you struggle with in one tool will be emphasized under the Difficulty ordering in the other. Screen shots of the Writing Settings and study screen follow. Like the other portions of DianHua Dictionary, these study tools pick up right where you left off if you get a phone call or other interruption. The only caveat is I don’t attempt to track exactly which bookmarks have been studied in a session which means you might repeat some bookmarks upon re-entering the program, but the settings you have chosen and the number correct will be retained. If you have any questions, comments, or recommendations, please let me know. Our excellent VPS provider Slicehost notified us today that DianHuaDictionary.com will be down briefly for maintenance at 4:00 AM GMT, Friday, June 12, 2009. My understanding is that this is preventative maintenance that will cause minimal downtime. 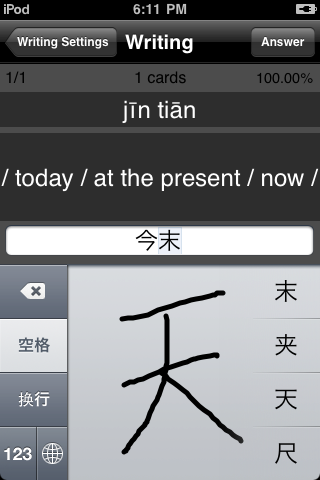 DianHua Dictionary contines to be available as a free download through the iTunes App Store. 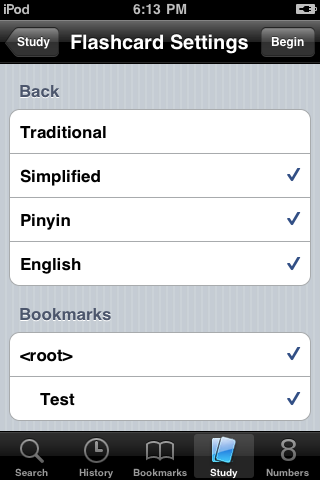 The DianHua Dictionary Audio Module is available for $4.99 USD. When I decided to integrate DianHuaDictionary.com with DianHua Dictionary, I knew I would need code to submit HTTP multi-part form requests. Unfamiliar with the iPhone APIs for network communication, I decided to look around the Apple Developer Forums and stumbled onto ASIHTTPRequest. ASIHTTPRequest is a BSD-licensed library built with all of the bells and whistles you need to perform most any conversation with a web server. For DianHua Dictionary, ASIHTTPRequest does the heavy lifting behind the Sync interface for user account registration and synchronization. Integration was simple and the API intuitive. That’s not to mention the little extras thrown in like automatic updating of progress views. If you’re writing a Mac or iPhone application and need an HTTP client library, I highly recommend you consider ASIHTTPRequest. 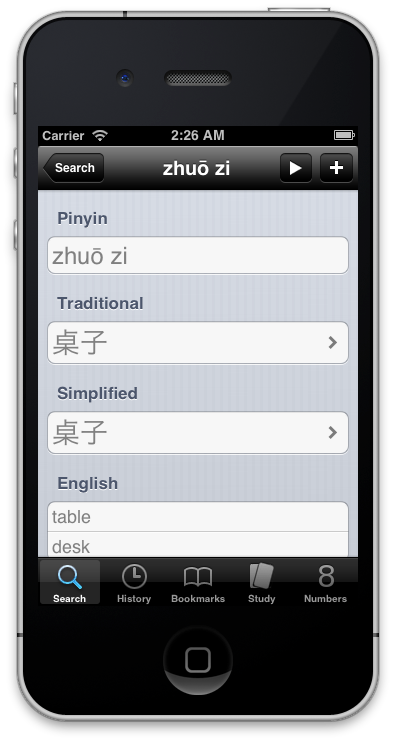 DianHua Dictionary v2.0 was rejected by Apple this afternoon for non-technical reasons. It will take me a day or two to make the required changes and submit it again. It’s entirely possible it could be rejected again on the next attempt so it may take a few weeks to work through their objections if the information they have provided is incomplete. 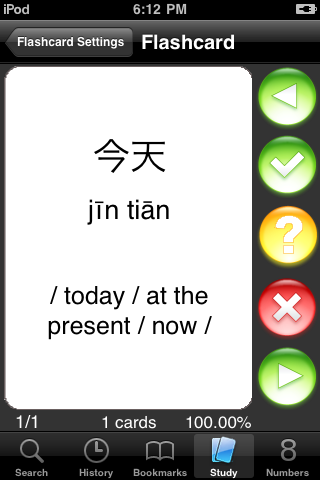 Integration with the DianHua Dictionary Audio Module providing pronunciation for over 16,000 dictionary entries. Support for Bookmarking dictionary entries organized in folder hierarchies. Integration with DianHuaDictionary.com supporting backup and export of History and Bookmarks. 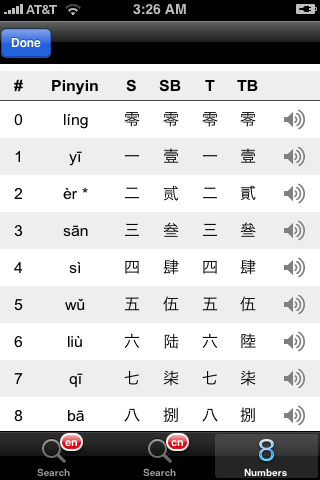 Searching by English, Pinyin, Simplified, and Traditional Characters now done from the same screen. A new search algorithm with sub-second performance on average. Improved quality of search results. Support for mixing search terms such as “ci dictionary” or “we wo3”. or even “他 men”. State restored when returning to the dictionary so you can pickup where you left off. A mistake on my part led to the DianHua Dictionary Audio Module being released early. To those who have already purchased it, I appreciate your patience in waiting for the dictionary and apologize for any confusion or inconvenience. It’s hard to believe I haven’t posted here since December 2008. Though only 3 months have passed, part of that time has seemed like an eternity to me due to an injury and the subsequent medical care. Before the injury in late January, I was closing in on completion of the DianHua Dictionary Audio Module, actively testing History and Bookmark support in DianHua Dictionary, and finalizing plans for the joint release of both products. Once the release plans had been derailed, I went on to exacerbate the delays by expanding the scope of DianHua Dictionary v2.0. In the interim, it appears that some other high quality CC-CEDICT-based iPhone dictionaries have been released. Hopefully those of you who have left for other dictionaries will give DianHua Dictionary another chance, but if not, I’m hopeful you have found what they need to continue your studies. That’s the main reason I’m here anyway. I’m trying to become fluent in Mandarin Chinese like many of you and anything that moves us closer to that goal is a good thing in my opinion. Beyond that, though, competition should help improve all of the dictionaries available on the iPhone and other platforms. Getting back to the main point of this post, I want to talk a little about the status of DianHua Dictionary v2.0 and the DianHua Dictionary Audio Module. 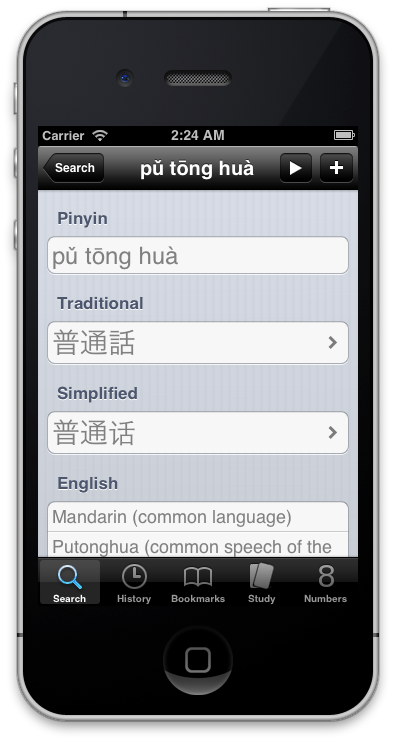 The DianHua Dictionary Audio Module was approved for sale in the App Store by Apple about 4 weeks ago. It includes over 7,000 Mandarin Chinese recordings covering over 16,000 entries in CC-CEDICT and will be priced at $4.99. Over time, the number of recordings will be expanded to include any gaps in our initial release. For the last few weeks, I’ve been pushing the release date out so that it will be released concurrently with DianHua Dictionary v2.0. While the audio can stand on its own, the application interface provides a simple pin1yin1 field and no list of what words and phrases are actually available. Alongside the dictionary, you simply press a speaker icon to open the audio application and hear the word spoken. Because it is of limited use without DianHua Dictionary v2.0, I decided to delay the release of the audio until v2.0 of the dictionary is available. So that leads us to the main question…where is DianHua Dictionary v2.0? The main issue has been deciding how to get History and Bookmark data out of the dictionary and off of the iPhone in a way that is useful to you, the users, in your studies. Initially, I took some very basic approaches that involved only the iPhone, but ultimately I decided that a web-based synchronization service was the best solution. You can visit DianHuaDictionary.com to see the work we’ve done. While a few pieces are incomplete, I wanted to make it available now so I could work out any kinks in the hosting setup prior to Apple reviewing the site and its integration with DianHua Dictionary. One major update in DianHua Dictionary v2.0 is the improved search performance and accuracy (seems like I say this at every release). DianHuaDictionary.com will give you a chance to preview the improvements in accuracy. There are even some functionality improvements gained from the new search algorithm. It now works perfectly well to search for “chi eat” if you didn’t know the tone or even “欢 welcome” to find “huan ying” if you only knew one of the characters. Of course, this approach can produce some unexpected search results. For instance, searching for “chi” will return “kai3” as one of the top results since one definition is “the Greek letter chi”. If you’ve read this far, you’re probably curious when DianHua Dictionary v2.0 will be available. At this point, I’ve given up making predictions. The best answer I can give is “soon”. The DianHua Audio Dictionary adds audio for over 7,000 words and phrases covering over 16,000 entries in DianHua Dictionary. The balance of the 100,000+ entries in DianHua Dictionary are synthesized from their component syllables taking into account appropriate tone change rules. Listen to the samples of the audio, and I think you will agree that Noah provides clear and precise Mandarin pronunciations that can help even the advanced learner hear some of the subtle differences between the various sounds of Mandarin. The real power of DHD Audio is in the ability to integrate Mandarin pronunciation into your study sessions. Make sure you select Audio for the Front and/or Back of your flashcards and practice listening to and speaking your Bookmark entries. Before submitting the recent updates to DianHua Dictionary to the App Store, I managed to squeeze in a couple more new features. 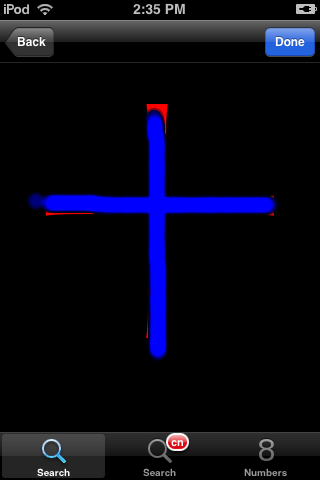 The most significant is the ability to draw on the zoomed view of Traditional and Simplified characters. This should allow those interested in learning to write Chinese characters a good opportunity to learn the shapes and practice. I’m still just a beginner, but I find the size of Apple’s character drawing keyboard challenging on the more complicated characters. This will give you a significant portion of the iPhone screen to work with until you’re comfortable with the character. The other major change you’ll notice above is the “en” badge was removed from the first Search item in the navigation toolbar. After reviewing the reviews from around the world this week, it became clear that everyone wanted to be able to search for anything from one search screen. I’m still playing with other ideas for layout and processing from a single screen, but for now, you can search English, Pin1 Yin1, Simplified, and Traditional characters from the first search screen. The only thing you can’t do is search for toneless Pinyin. The “cn” search option remains for toneless Pinyin and for those who like having both screens available. If there’s strong demand to do so, I can remove it. Search now performs an exact match by default. If the exact match does not yield the desired results, you can access the exhaustive search by touching “More”. This change cuts search times in half on average. The English search page is no longer labeled “en” as it will now accept English, toned Mandarin Pinyin, Simplified, and Traditional characters. The Chinese search page can still be used for all Chinese searches including toneless Pinyin. The magnified character view includes a drawing function to allow you to practice writing characters using the magnified view as a template. 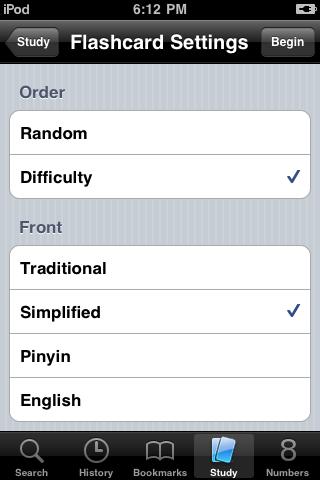 The Number reference includes the enhanced number converter developed for our Number Practice application, LianXiShuZi. 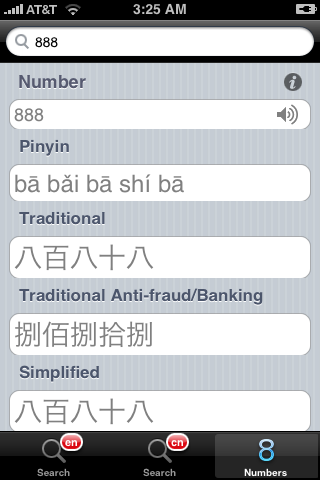 You can use it to convert numbers from digits to Pinyin, Traditional characters, Simplified characters, and the Anti-fraud/Banking equivalents. Audio pronunciation of arbitrary numbers is included with the Number reference. Touch the speaker to hear any number pronounced. 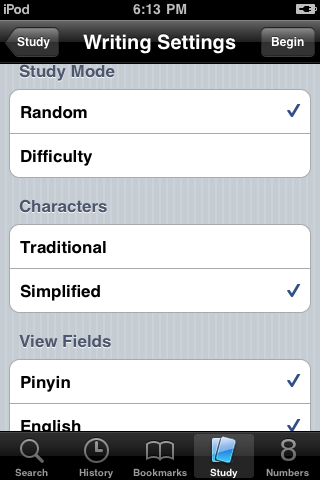 DianHua Dictionary v1.4.1 BETA is now available for testing. This release includes the “exact search” changes discussed in a previous post as well as some interface cleanup. It also includes the technology developed for our number learning application, LianXiShuZi. The application no longer includes the list of numbers. Instead, it provides a conversion tool capable of producing pinyin, traditional characters, simplified characters, and the banking/anti-fraud variations of characters. When you touch the speaker icon for a number, you can hear the number spoken for you. There is also a help icon leading to a page describing how numbers work. I also changed a few user interface issues that I’ve never been pleased with. Gone are the Cancel buttons on the search bars. They’ve been replaced with the ability to touch outside the search box to dismiss the keyboard.